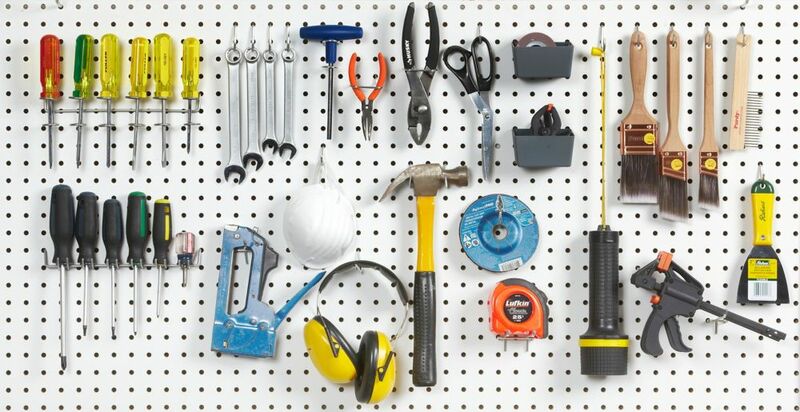 Pegboard Organizer Kit is perfect for use in the garage, workshop, tool shed, basement and throughout the home. This long, double-arm tool hanger takes tools, toys, garden furniture and much more off the floor and allows you to reclaim that space. The double-arm configuration, with foam rubber padding, ensures larger or heavier tools stay put when you hang them. In tight spaces the hanger folds up when you're not using it. For convenience, the hanger mounts quickly on slat wall or regular drywall. If your garage, basement or garden shed is short on storage, these sturdy utility brackets are the answer: capable of supporting up to 20 pounds and simple to mount with the provided screws, they'll keep everything from spare lumber and pool toys to winter skis and long-handled garden tools all organized, easy to access and off the floor. The Gladiator 8 ft. Adjustable Height Hardwood Workbench with Hammered Granite Finish ensures a perfect fit for every work space. The heavy-duty steel legs are as tough as they look and the robust 1-3/4 inch hardwood top supports up to 3,000 lbs. to provide a sturdy foundation to build upon. Add a stool or coordinating Modular GearBox for even more versatility. Lifetime Wall-Mounted Work Table- Features a wall-mounted powder-coated work station with fold-in varnished wood work surface. Includes interior and exterior steel pegboard, storage hooks, and the table top can be adjusted to mount at a fixed height between 34 -42.3 in. (85,5 -107,4 cm). Comes with a 5-year limited warranty. 43 Pc Peg hook assortment Pegboard Organizer Kit is perfect for use in the garage, workshop, tool shed, basement and throughout the home.